Stakeholder engagement is never a slam-dunk. It takes strategy, work, commitment, focus and resources. There are no shortcuts! Decades of experience has taught that even when the benefits to stakeholders seem obvious mis-steps can derail progress, causing delays and even killing projects. And, when projects are more controversial and have less obvious local benefits the risk is compounded. Not enough focus on value. Early constructive and pro-active engagement with a focus on creating and communicating meaningful value alignment with local stakeholders is as important as a project’s technical and economic viability. And should receive similar strategic attention. Too slow to engage – A lot of problems could be avoided if organizations actually started their engagement efforts earlier. Too often the engagement process doesn’t begin until there is a sense of inevitability around the successful completion project. Engagement can’t be an afterthought! Without that early engagement you create a knowledge vacuum that leads to rumours (disguised as facts) that feed opposition and makes everything more difficult – and costly. Too much reaction – In a previous post I said that sometimes the best thing to do when it comes to engagement is to simply start with listening. Then listen some more. Let stakeholders speak and share their thoughts, understandings, concerns and issues. Don’t react and be defensive. It’s hard to listen as someone misrepresents what you are trying to do and puts forward misstatements as “facts.” But becoming defensive and getting into a credibility battle against local stakeholders is a fight that becomes very hard to win and can solidify opposition. When the corporate response is too defensive it creates ‘positional’ situations that makes it difficult to bridge gaps and find alignment. Engage constructively, not defensively. Listen. Listen some more. Listen more, and make sure you hear. Not enough value – At the core of any successful CSR endeavour is value. The goal is to develop meaningful alignment between business value, social impact and environmental performance, while also creating strategic competitive advantage for the company and project. Understanding and illustrating that link between corporate/shareholder interests and those of the community is critical. This should be a concurrent priority, equal in importance and focus with determining the technical and economic feasibility of a project. 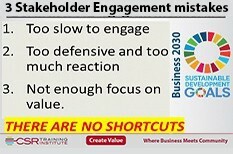 Get stakeholder engagement wrong and your project may fail, or get way more costly and take a lot longer. Remember, many projects have been technically right, all the way to failure. Disgruntled local stakeholders, often supported by external interests, can trump a project’s technical and economic feasibility and ruin companies and careers. Community engagement is probably one of the least expensive parts of any CSR project. But it is also one of the most important. When done right, it can align business value and stakeholder value, creating positively engaged stakeholders and competitive advantage for companies and projects.. However, when a company screws it up the costs can be extraordinary and even put a project at risk by alienating locals and scaring off business partners and investors. Community engagement is something every organization must learn to master if they are going to succeed with CSR in the future. If you want to discuss how you can do it better then please contact us for a complimentary 20 minute consultation.